The innovative mechanism of action of the first Optinose technology is designed to enable broad, consistent drug delivery high and deep in the nasal passages, leveraging the mucosal surfaces as a potential target for the treatment of both local and systemic diseases. 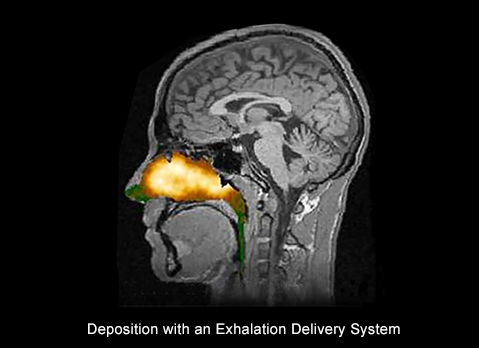 These Bi-Directional™ Exhalation Delivery Systems (EDS) offer a much-needed alternative to traditional nasal sprays, as well as nasal nebulizers, tablets, and injections. 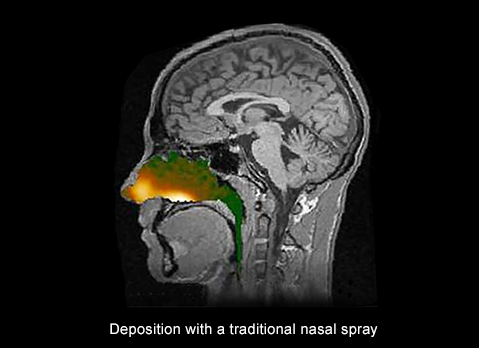 Gamma camera images after using a traditional nasal spray device or the Optinose Exhalation Delivery System. Both images are from the same subject and are representative of the overall findings from 211 images and 56 subjects. The clinical relevance of different deposition patterns has not been established.